Pick a date. Confirm your date with your school music office as early as possible to receive the day and time you want. Be sure to check with your teacher and family to confirm that they are also available. Confirm your venue. Most programs have a specified recital hall for junior and senior recitals, but make sure it is available on your date and time. Talk with your school’s recital coordinator or teacher to reserve your venue. Choose your repertoire. Discuss ideas with your teacher, making sure to include pieces appropriate for your ability level and time requirements. Recitals are typically 45-60 minutes, so check to see if your program specifies a minimum or maximum time limit. Be sure to include variety in your program, whether it is compositional style, composer nationality, era (Baroque, Classical, Romantic, Contemporary) chamber music, unaccompanied, etc. Find an accompanist and any other musicians necessary for your program. After you’ve finalized your repertoire, find an accompanist who is available on your recital date. If possible, use an accompanist who is familiar with your repertoire or your instrument. Make sure to also confirm any other musicians you need for chamber music. This is the time to establish fees for accompanists – see if they charge per rehearsal, by the hour, or a flat rate for the recital. Purchase your music. Order any pieces of music that you do not already own. Replace any photocopies with original scores – never play off of a photocopy at a recital! Study the scores and listen to recordings. As you practice your part, familiarize yourself with the piano or other instrumental lines. Mark in piano cues or other important entrances into your part. Schedule rehearsals. It may seem early, but schedule rehearsals with other musicians as early as possible so that their schedules don’t fill up. It is never too early to start rehearsing with your accompanist, even if you have to play everything under tempo. Schedule a dress rehearsal. This is the most important rehearsal before a recital, because it is probably the only time you will be able to do a complete run-through of your recital before the big day. See if your venue is available 1-3 days before your recital to do a rehearsal of your recital music from beginning to end. I suggest wearing your recital outfit, or at least your shoes, during the dress rehearsal. Confirm that your accompanist and any other musicians are available for your dress rehearsal. Write your program and program notes. Include, titles, movements, composer, composers’ years, performers, notes on the music, performer biographies, and any other information required by your music school. Double check your work and have your teacher or someone else proofread your program notes for any errors. Don’t forget to submit it far in advance to whoever is in charge of printing programs! 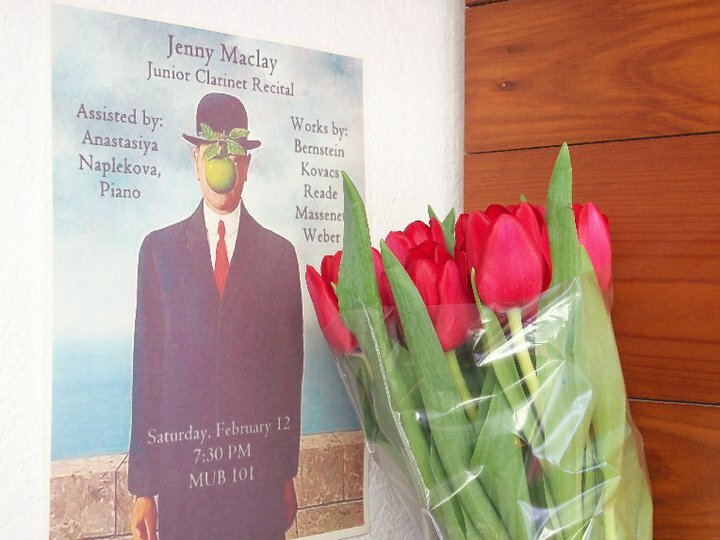 Create a recital poster. Find an image or use your headshot to create a recital poster. Include recital date, time, location, repertoire, performers’ names, and any useful information. Here is the poster I made for my junior recital. Choose your recital outfit. The most common recital attire is a suit for gentlemen and a gown or formal dress for ladies. For women, I advise something at least knee-length to prevent any embarrassing mishaps involving an elevated stage. Also be aware of tops that could give an audience an eyeful when you bow. Whatever you choose, make sure it is comfortable and easy to breathe in (especially important for wind players). Find shoes that aren’t painful and practice walking in them to avoid any tumbles on stage during your recital. Create a Facebook or Livestream event. Invite your friends and family to attend your recital. Include date, time, location, directions, parking information, repertoire, names of other musicians, and any other information related to your recital. Get any necessary instrument repairs. Carefully examine your instrument with your teacher to look for anything that needs repairs, such as torn pads, noisy keys, tone holes that don’t cover, or any other problems. Make a list and take your instrument to a reputable repair technician to make these adjustments. Never change anything on your instrument the week of the recital unless it is not playing properly. Make sure the piano is tuned. Most music schools regularly tune their pianos, but it never hurts to check. Be ready to spend some money for a piano tuner if it’s not covered by the school. Plan your page turns. The greatest performer can be humbled by an awkward page turn. Go through your music and look for any awkward or quick page turns. Get crafty with some scissors and tape – photocopy pages (never cut your original music!) and find ways to avoid bad page turns by taping pages together or cutting and taping smaller sections of one page to other pages. Recruit a page turner. While we’re on the subject of page turns, find someone who is willing to turn pages for your pianist at the recital. Preferably, find someone who has page-turning experience or is familiar with reading piano music. Ask them to come to your dress rehearsal and remind them to dress appropriately for the recital. Recruit a recorder. Some lucky schools have graduate students or other volunteers in charge of recording recitals. If not, find someone who is willing to record your recital (both audio and video). If you don’t have a recording device (Zoom and Tascam are popular recorder brands among musicians), either buy one or borrow one from a friend. Find a recital photographer. You don’t need a professional photographer (unless you’d like to have one), but find someone who can take pictures during your recital. If you want a lot of photos from your recital, create a hashtag like #jennyclarinetjuniorrecital and let the audience know so they can tag any pictures they take. Find someone to control the lights. Even if it’s as simple as turning on lights during intermission, this is one less thing for you to worry about during your recital. Practice bowing. This might seem silly, but many musicians performing their first recital forget to bow until they hear the applause during the recital. Practice bowing in front of a mirror – hold your instrument firmly, bow and look at your feet and count to three. Smile at the audience, then walk offstage. Recital etiquette dictates another bow if the audience is still applauding after you have walked offstage, and there will usually be at least two bows at the very end of a recital. Don’t forget to acknowledge other musicians after performances as well. Watch recitals on YouTube to become familiar with bowing and other aspects of stage presence during performances. Consider a post-recital reception. This is optional, but it is always nice to have drinks and snacks after a recital so guests can mingle. This is also a great opportunity for a meet-and-greet with the musicians. Prepare your recital things. Lay out your recital outfit and shoes, pack a bag with all the items you need for the recital, and check to be sure you have all your music. Do as much as possible today to save time and stress on the day of the recital. Treat yourself. Indulge in relaxing activities – binge-watch a Netflix show, read a book, take a nap, get a mani/pedi. Anything that gets you in a good mental state for your recital. Eat enough food and stay hydrated. Different people prefer different amounts of food before a recital. Eat enough so you’re not famished, but don’t eat so much that you feel sick. Bring a water bottle with you to the recital. Don’t do anything out of the normal. If you drink coffee every morning, don’t stop now. If you always take the same route to school, don’t explore another route now. Even a slight change in routine can wreak mental havoc on recital days. Don’t practice too much. Get a good warm-up and put your instrument away. You will not make any significant progress on the day of your recital. Trust in your preparation and save your mind, hands, and embouchure for the recital. Set up the recital hall. Unlock the piano, find enough music stands, move chairs, lay out programs, and do whatever else you need to prepare the recital hall. Get dressed 2-3 hours before your recital. Leave enough time for hair, makeup, getting dressed, and driving to the venue. Set up your recording and streaming devices. I like to do this about an hour before the recital starts in case of any technical malfunctions. Test your streaming on another phone or computer to make sure you are live. Set up refreshments for after the recital. If you want to have a post-recital get-together, have a friend set up a refreshment area and a few chairs outside the recital venue. Pay your accompanist. I always pay my accompanist before a recital so I don’t forget in my post-recital haze or when I am surrounded by people after a recital. Make a “silence your cell phones” announcement. And be prepared for one to go off anyways. You can also tell audiences to avoid flash photography if this will disrupt your concentration during your recital. Lights, camera, action! Take a deep breath, go on stage, take a bow, and share the music with your family and friends! Clean the recital venue. Move all chairs, pick up any trash, lock the piano, put away music stands, and look around for anything you might have forgotten (music, reeds, instrument stand). Don’t forget to lock the door! Submit any necessary recordings or paperwork required for your degree. After all your hard work, don’t let a technicality prevent you from the recital grade you deserve! Thank everyone who helped make your recital successful. I like sending handwritten letters thanking my teacher and anyone who helped during my recital preparation, but a verbal or email message is also fine. Recitals are a rewarding and special event in any musician’s life (despite the occasional stress and anxiety you will experience), and I hope this article helps you have a great performance experience. Let me know in the comments below what else is on your recital checklist! Here is a simplified Recital Planning Checklist for you to print and use while you are planning your next recital. Thanks for posting. I found your checklist to be helpful. I booked a recital date and a recital venue in October 2017. My clarinet instructor, Dr. Nikolasa Tejero and I chose my repertoire in January 2018, but did not finalize my music selection until February 2018. She wrote my program for me, and I wrote the program notes to go with the program. I performed my senior recital on April 14th 2018. Congratulations on performing your senior recital! I’m glad my checklist helped, and I hope it helps you with many more recitals in the future!